We’ve released the February 2016 issue of php[architect] magazine. This issue looks at tools to help you powerup your workflows to improve your productivity. 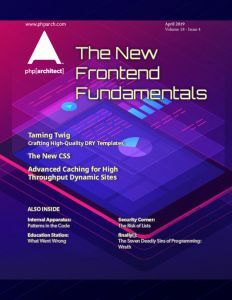 This month we have articles on using Docker for PHP development environments, evaluating different Git workflows, how to build a Continuous Integration and Testing environment, and using Symfony’s Event Dispatcher. Our columns explore using the Git Extras tools, using automated tools to assess code quality, using secure defaults in components, and a look at how we build a conference schedule. New this month, Cal Evans takes the reins as our Community Corner contributor. Download a FREE article and get your issue here.